St Petersburg stadium is designed by Japanese architect Kisho Kurokawa. Image: courtesy of Transstroy. The stadium features a retractable roof, which means events can be held all year round. Image: courtesy of Transstroy. A massive dome is designed at the top and held by eight masts. Image: courtesy of Transstroy. The roof of the stadium has an area of 71,00m2. Image: courtesy of Transstroy. The stadium is one of 12 venues selected to host the FIFA 2018 matches. Image: courtesy of Transstroy. The roof of the stadium will have an area of 71,000m². Image: courtesy of Transstroy. The new St Petersburg stadium was inaugurated in 2017 and replaced the Kirov Stadium on Krestovsky Island in St Petersburg, Russia. The landmark venue was designed by Kisho Kurokawa and will serve as a multi-purpose destination for various events. The stadium hosted the opening match and final of the FIFA Confederations Cup 2017 and will also host the semi-final matches of FIFA 2018 after Russia won the bid to host the international event. 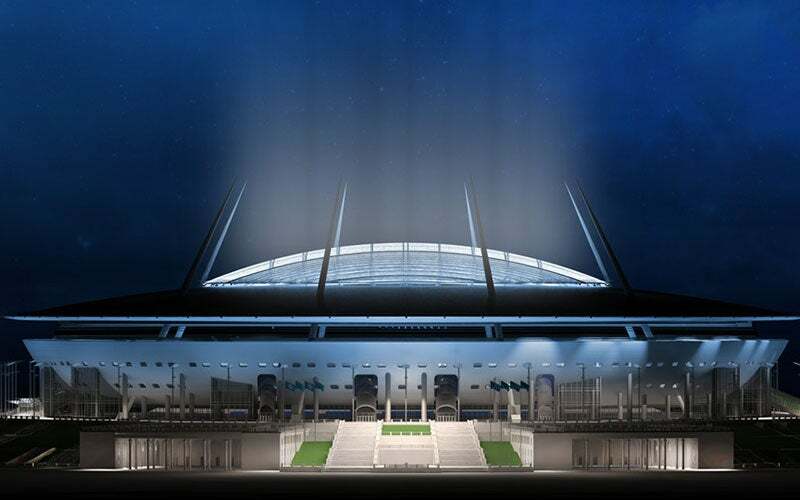 It will be the home to local soccer club FC Zenit St Petersburg. The stadium was known by several popular names such as Zenit Arena, Gazprom Arena and Piter Arena before an official name was selected in October 2015. The delayed stadium has been under construction since 2006 after the design architect was selected through an international design competition in 2005. Lead contractor Avant abandoned the project midway, which led to the search for a new contractor. Certain issues emerged after Russia’s winning bid to host the football world cup was announced. Issues relating to the design had to be revised to increase capacity from the earlier 62,000 to 68,000 and also to build a stadium compliant with the highest international regulations. Complicated by controversies and corruption charges, the construction cost of the stadium inflated from the initial sum of RUR6.7bn ($84.9m). Costs increased from RUR34.9bn ($442.7m) to RUR43bn ($738m), making it one of the world’s most expensive stadiums. The stadium is a 79m-high, seven-storey building with a massive dome and the roof is held by eight large masts. A retractable roof and a sliding pitch were included in the design to make the stadium one of the most modern arenas. The retractable roof enables the venue to host events throughout the year as temperatures within the stadium will remain moderate. It is also equipped with a hot air-inflated membrane structure that will melt snow during winter. The innovative design of the sliding pitch allows the movement of a 120m x 80m field through electric motors with the assistance of air pillows. This arrangement enables the venue to be used for concerts, exhibitions and other sports as the pitch can be temporarily moved outside the stadium. The multi-purpose venue is built in an area of 287,600m², of which 26,000m² is used for commercial operations. The stadium roof covers an area of 71,000m². Parking is available for 240 slots inside the stadium, while an additional 2,732 spaces are available on land adjacent to the stadium. The stadium has a capacity for 68,000 spectators during football games and it can accommodate 80,000 theatre and concert goers. Seating can be arranged in two tiers with the lower level having a capacity of 22,000 people and the upper tier equipped to seat 46,000 spectators. A total of 14,270 seats are reserved for fans, 560 seats for spectators with limited mobility, as well as 104 luxuriously designed skyboxes. Eight snack bars and eight restaurants are provided with 4,962 seats. The stadium is easy to access for disabled visitors with special lobbies, elevators and ramps for delivery by service vehicles, as well as warning indicators before each flight of stairs and special control devices. The structure of the stadium weighs 32,000t, which is equivalent to the weight of four Eiffel Towers. The amount of concrete used for constructing the stadium is five and a half times more than that used for erecting the Wembley Stadium. The steel roof of the stadium is designed as a supporting truss structure that is round in the middle and resembles a concave-convex lens in profile with the playing field at its centre. Carriageway trusses have been designed above the field to allow the roof to open and close. The roof is supported by eight inclined reinforced concrete pylons and a stay cable system that supports the dome. The stadium’s bowl features an exterior of silver-grey achieved through aluminium composite panels, Alubond. Glazing products from AGC were used to give finishing touches to the stadium’s exterior. The base of the facade is composed of a ceramic metal panel and an anti-graffiti and anti-vandal cover. A translucent ethylene tetrafluoroethylene (ETFE) film is used for the retractable section of the dome to provide protection from the weather and will also be used for projection purposes. Transstroy is the general contractor for the project, who replaced Avant in 2008. Werner Sobek was selected to provide structural engineering and facade planning.